Osteoarthritis is a progressive degeneration of the joints. It results when the protective surface (cartilage) that allows the joint to move smoothly is damaged. Over time this cartilage is worn away and adjacent bones are remodeled as the joint becomes increasingly abnormal and 'rusty', resulting in pain and stiffness. Osteoarthritis of the shoulder is less common in comparison to many other joints, principally the hips, knees, and hands. It is nonetheless a debilitating problem and can have a significant impact on the patient's life. Traditionally thought of as a 'wear and tear' phenomenon the cause of osteoarthritis is generally unknown however several contributing factors have been identified these include; prior shoulder surgery, history of trauma, inflammatory conditions (mainly Rheumatoid arthritis), and shoulder overuse. Individuals particularly at risk are those who engage in high intensity overhead activities such as weightlifters and racquet sport players. Patients with arthritis of the shoulder will classically complain of a stiff and painful shoulder, with a limited range of movement. Description of pain and stiffness that intensifies with use is common as is painful interruption of sleep. "Catching" and "noise" heard during movement is another routine finding. Osteoarthritis is usually diagnosed by a combination of clinical examination and history of the presenting complaint. Prior to proceeding with treatment, X-rays may be taken to evaluate the extent of any damage which may be helpful in deciding upon the most suitable treatment. Similarly a CT scan of the shoulder may also be requested if it is decided that surgical management would be the most appropriate option. Painkillers and anti-inflammatories - mild/ moderate pain killers and anti-inflammatory medications may be taken to provide symptomatic relief. However these drugs are in no way curative and will not alter the course of the disease. Steroid njections - are often given to provide short-term relief to the patient, though this period is unpredictable due to the wide variability of the disease. Repeated injections should not be given as a long term cure as they can cause further damage to the joint. Hyaluronan injections have ben shown to be beneficial for early arthritis and where surgery is contraindicated. They seem to provide longer benefit than steroid injections with less side-effects. However, they are more costly. The form of surgery chosen should be the least invasive approach required to provide long term pain relief and restore function. Arthroscopic treatment of the shoulder for osteoarthritis is primarily a temporary therapy in which the joint is "tidied up." The surgeon removes unwanted material and smoothes off the joint, hopefully providing relief of symptoms. As mentioned previously this procedure typically provides relief for a limited time only after which more definitive measures i.e. arthroplasty are required, it's role is therefore limited (mainly to the young). Ultimately in cases of severe non-resolvable pain or previous failed treatment options, shoulder replacement (arthroplasty) is indicated. 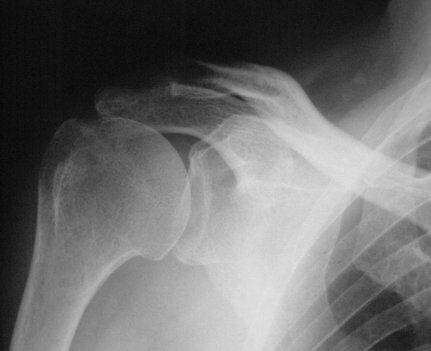 There are a number of variations of shoulder replacements available, some more invasive than others. The choice of replacement depends on a number of criteria these include: your surgeon's preference, age, activity level, form of arthritis, and the amount of bone affected. Traditionally the two forms of replacement that have been used are; hemiarthroplasty and total shoulder arthroplasty. Hemiarthroplasty involves a prosthetic metal implant being placed into the upper bone in the arm (humerus) which forms half of the shoulder joint. Whilst in total shoulder arthroplasty both sides of the joint are replaced. An alternative joint reconstruction is humeral head resurfacing. In this procedure a small amount of the affected bone is removed from the humeral articulating surface (head) and replaced by a smooth metal cap. This is a particularly good treatment for active young patients as it typically provides good relief and is easy to revise if the condition deteriorates in the future. For the majority of patients, we prefer the surface replacement procedure , but this may not be suitable for all patients. - Keep doing as much of your normal routine as possible. - Remain active to keep muscle strength from diminishing. If you work up to a well-designed exercise program, you can keep or even improve joint flexibility. - Rest only when joints are very painful.